Even though this is part II this is actually where it all began, this dipped hem fixation I find myself gripped with. 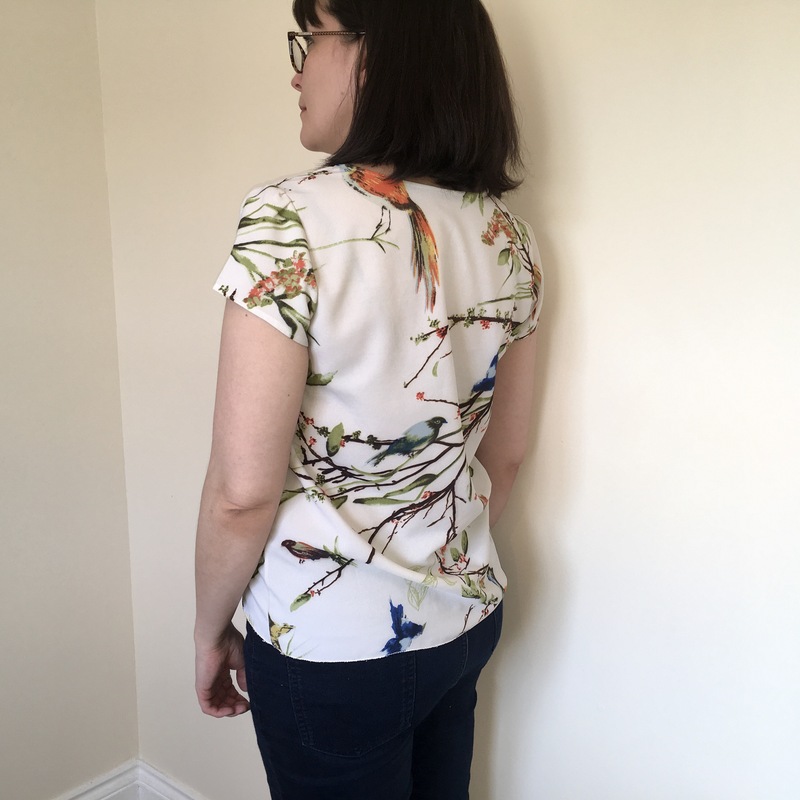 I blame this very pretty poly crepe I found on eBay with birds on it! A fabric like this certainly requires a very simple pattern, let the fabric do all of the talking and such like. 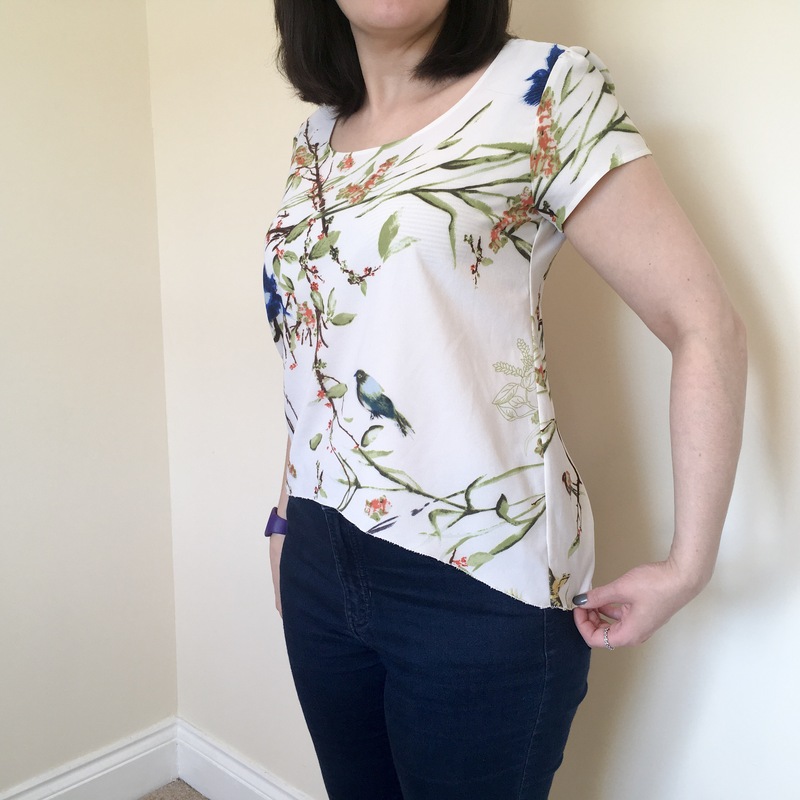 The obvious choice for me was to use the good old Scout tee pattern (I’ve made it so many times now I think I can do it in my sleep), but I didn’t want ‘just’ another Scout tee. Then I had an idea, the Scout already has a kind of subtle dipped hem… what if I just exaggerate it? 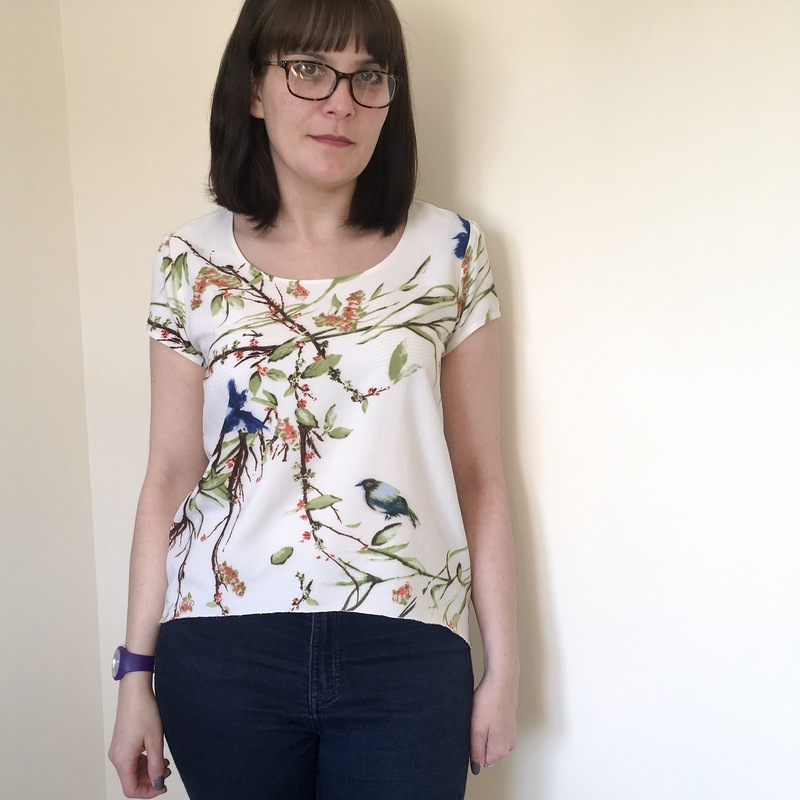 I didn’t do quite as well with that one… it’s poor head disappears in the neckline hem. So pattern was made up in a 34″ bust as usual, but on the front piece I used my French curve to cut away much higher a line on the hem. I actually left the back as is. 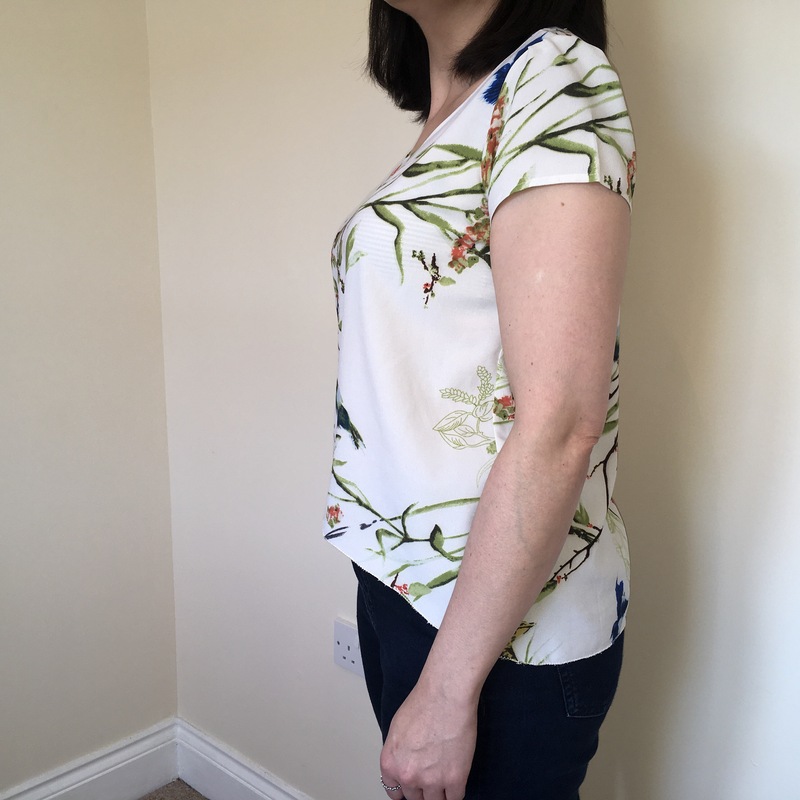 The drama of the hem can really only be seen from the side… as can my stripy bra (good grief!) I really must buy myself more neutral coloured bras!! Anyway let’s stop gawking at my bra and get back to that hem! It kind of gives the effect of wearing a cropped tee from the front, but still has all of the bum coverage I like on the back, I call that a win win situation! When it came to hemming I zig zag stitched over the edge in preparation for just turning and stitching it… then really liked the effect. It’s got a few tiny threads still sticking out which I think make it kind of rustic… let’s call it a design feature. So all I did was to do a second row of zig zag just to make sure it would stick… then trimmed down some of those longer loose threads. Because this is a crepe it sits nicely and behaves itself and we get along just fine. 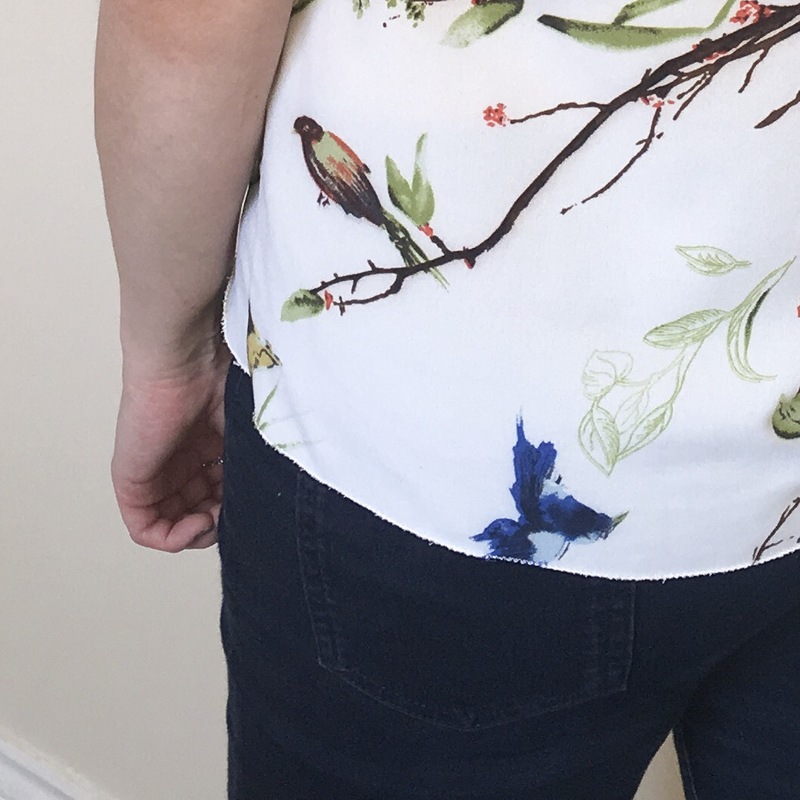 I even attempted a bit of pattern placement stuff on the sleeve… just to get a little consistency with the leaves versus plain cream. I think it went well. So a tiny bit of pattern hacking goes a long way to making this feel very different from my other Scout tees. And this really kick started an obsession with dipped hems, I think I went straight from this to the dress I told you about earlier. Yeah also I’m not blogging my summer makes in the order of when I made them, it’s really whenever I get round to photographing them… you get it right? So stay tuned for dipped hems part III (the dipped hem strikes back)… ha ha, I really do amuse myself! 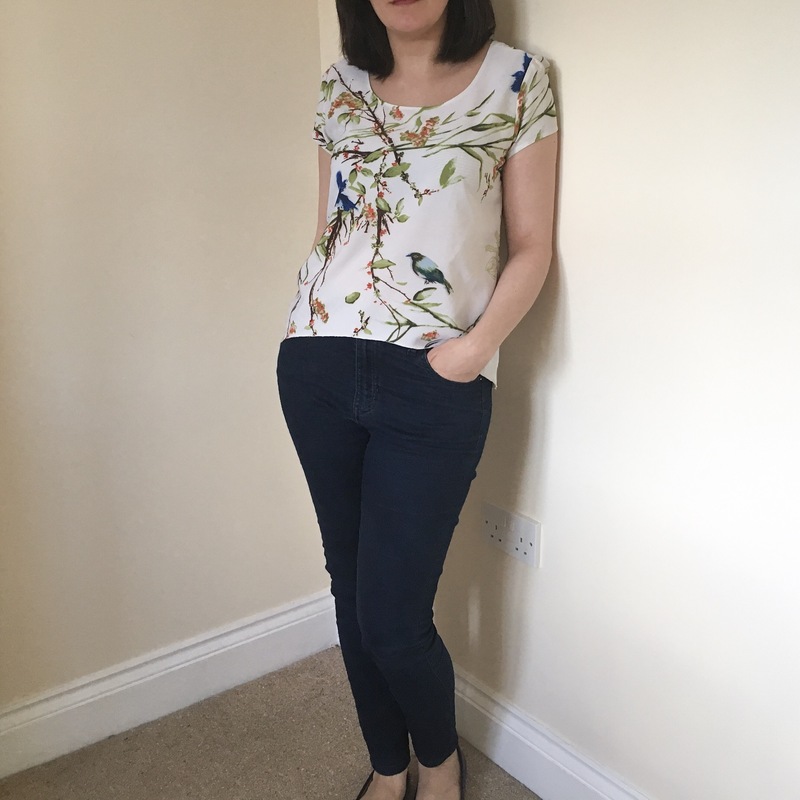 Next Post The high-low hem… the final chapter?